1 Piece Water Colour Pad. - Premium drawing paper made from 100% wood pulp, Warm white color, artist quality, acid free. - Material: Paper. - Great gift for students, teachers, artists and more. It is strong enough for your entire watercolor and sketchbook painting that will not bleed through. - Works with all watercolor paint and markers for sketching, drawing and painting. 1 Piece Watercolor Paper Pad. Great for using with watercolour paints. 1 X Sketch Book. Use for landscape or portrait orientation, student, hobby or amateur use. Material: Paper. Cover Color: Yellow. Ideal for working with watercolors in various techniques, as well as for working with soft graphic materials. The surface of the paper is grainy and rough. Value for money is ideal for novice artists. Consists of individual sheets of paper. Internal block-drawing woodflooring paper, density 200 g / m². White sheets with embossed eggshell on one side and smooth on the other side. on the back you can draw with pencils. Paper with embossed shell, 200 g / m2. CHITRAPAT HANDMADE WATERCOLOR PAPER BLOCK MATTE (A4). Chitrapat handmade watercolor paper block/drawing paper block. The handmade papers are made from 100% cotton fibre. Paper made from 100% cotton Fibre, Acid Free. Special paper is designed for drawing watercolors. Does not deform when soaking. The block is a dense offset A4 paper, 20 sheets. Cover - coated cardboard. Professional grade watercolor of the highest quality. 100 percent cotton, cylinder mould made with natural gelatin sizing. Flawless texture surfaces, acid-free and buffered. Block of 20 sheets bound on all 4 sides. Tablet for watercolor "Tea Rose" 200 g / m2 A4 21 x 29.7 cm gluing 20 liters. Mounting type:gluing. Density, g / m2 Format: A4. Item Type: The tablet. Width, cm: 21. Length, cm:29.7. Tablet for watercolor "White Rose" 260 g / m2 A4.linen, texture canvas. Annotation to "Tablet for watercolor" White Rose ", 20 sheets, A4, flax (PLBR / A4)". Tablet for watercolor "White Rose". Indoor unit: card paper embossed "Flax" fawn, density of 260 g / m2. Format: A4 (210x297 mm). Premium drawing paper made from 100% wood pulp, Warm white color, artist quality, acid free. 1 Piece Water Colour Pad. - Material: Paper. - Color: White. CHITRAPAT HANDMADE WATERCOLOR PAPER BLOCK ROUGH (A4). 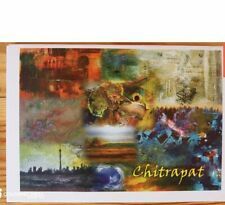 Chitrapat handmade watercolor paper block/drawing paper block. The handmade papers are made from 100% cotton fibre. Paper made from 100% cotton Fibre, Acid Free. CHITRAPAT HANDMADE WATERCOLOR PAPER BLOCK MATTE (A4). Chitrapat handmade watercolor paper block/drawing paper block. The handmade papers are made from 100% cotton fibre. Handmade Watercolor Paper Block MATTE A4. 150gsm Textured Paper. Premium Textured Paper 150gsm, with 20 sheets per book. Watercolour, Drawing, Sketching. High quality drawing and sketching book by Inspira. In addition, it features You'll find countless ways to fill these pages and will find that the convenient, durable design makes it easy to take with you anywhere. Durable, Acid-Free Paper - Bellofy sketch paper is strong, smooth and absorbs colors and lines more readily, reducing blotching, smudges, and accidents. Color flows freely onto the smooth surface of this weighty 300gsm (140) paper. It accommodates heavier watercolor washes and more subtle work. The smooth, natural wove texture of the paper won't break through. And because it’s acid-free and absorbs ink more readily, you can worry less about smudges, stains, hand prints or color transfer. Durable, Acid-Free Paper – Bellofy sketch paper is strong, smooth and absorbs colors and lines more readily, reducing blotching, smudges, and accidents. 1 Piece Water Colour Pad. - Premium drawing paper made from 100% wood pulp, Warm white color, artist quality, acid free. - Material: Paper. - Color: White. - Great gift for students, teachers, artists and more.